Steep 2 cups of boiling water with two green tea bags. Let sit for 10-15 minutes to make sure tea is very strong. Pour tea into ice cube trays to freeze. Let freeze solid. 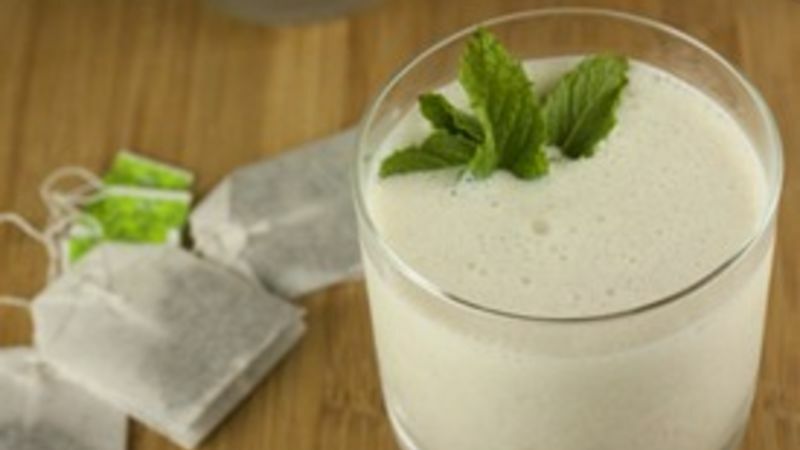 Add green tea ice cubes to blender with other ingredients. During the summer months, my breakfast of choice is a big hearty smoothie. I usually make mine with bananas, frozen fruit, yogurt, tofu, orange juice, and sometimes flax seed. It’s really filling and a great way to start the day. But there’s another way to do smoothies – a lighter way. With green tea! It takes just a few minutes to blend up, assuming you prep the ice cubes beforehand. 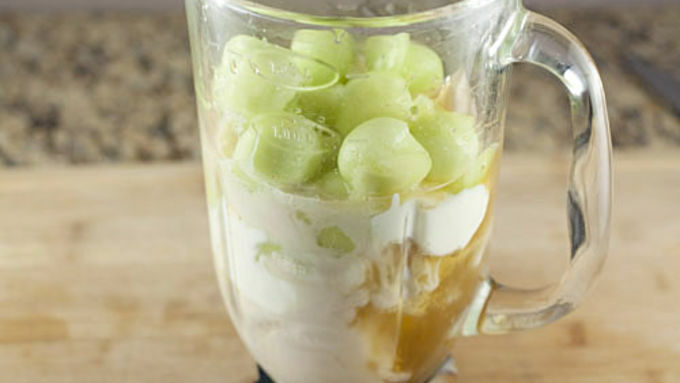 This smoothie is a healthy afternoon snack that’s completely refreshing and delicious. The key to this smoothie is in subtle flavors. Green tea is far from strong in the flavor department so you want to make sure not to overpower it with anything too strong. Putting something like orange juice in this would hide the subtle green tea flavor. Also, to make the flavor as strong as possible, be sure to brew some really strong green tea. 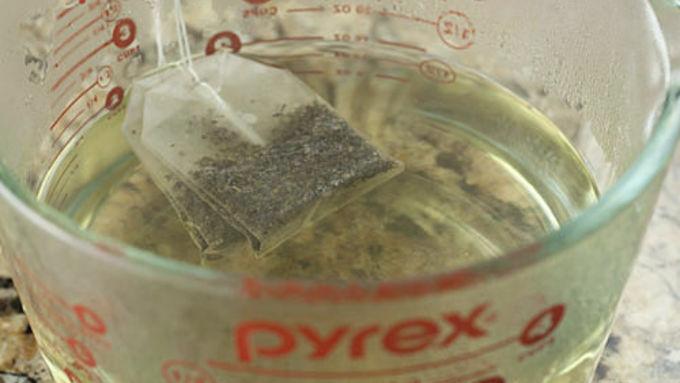 I added two tea bags to two cups of boiling hot water and let them steep until the water cools down to room temperature. That should make the tea about as potent as it can get. Instead of adding ice to the smoothie later on (which would dilute it), add the tea to a few ice cube trays and freeze it. That’ll provide the ice for the smoothie and keep the green tea flavor really strong. Besides the tea, there are just a few ingredients that I recommend using. It always helps to have a creamy component to a smoothie and for this version I went with plain Mountain High Yoghurt (for less sugar) and almond milk. You could use normal milk if you wanted, but the subtle almond flavor and green tea actually work well together. To give the smoothie a bit of sweetness, I added a good drizzle of honey and some honeydew melon, which gave it a nice fresh flavor. Since this is more of a snack than a meal, a small serving of this smoothie is more than enough for a nice refreshing snack. Literally, it’s like a cup of tea. Except frozen! I sat outside in near 100-degree heat while drinking this and it was completely cooling. The green tea is subtle, but definitely there and all the other flavors just keep the whole thing nice and light. 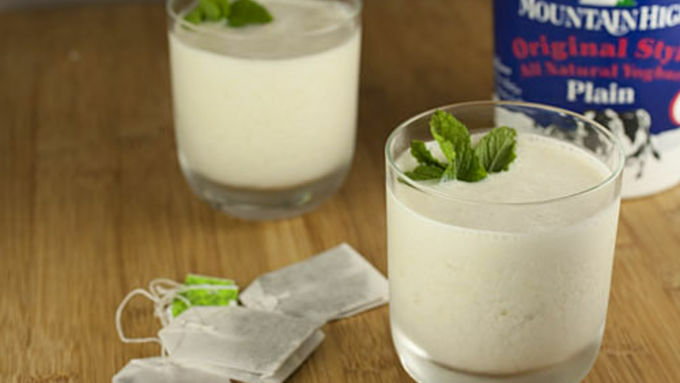 This is a quick drink that will cure your summer heat woes for sure! Check out some more of our favorite summer smoothies to beat the heat.